This book contains three long stories, (perhaps novellas): “The Gun With Wings”, “Bullet For One” and “Disguise For Murder”. In the first story, “The Gun With Wings”, Nero Wolfe and Archie Goodwin must prove that a death which has been ruled a suicide by the police is actually a murder, and who committed the crime. The problem is the murder weapon, a gun, seems to have moved from place to place between the time the crime was committed and the time the witnesses came upon the scene. If it’s a murder, who moved the gun and why? As usual, the suspects are gathered in Wolfe’s office at the conclusion, and the genius detective manipulates things in such a way as to reveal the killer. A fine story. “Bullet For One” concerns the murder of a top drawer industrial designer, and claims that he had been stealing work of a competitor, who is suspected of the crime, though he has a perfect alibi. The murder took place on an equestrian riding trail, a single bullet fired, the body hidden in shrubs, the horse left to return to it’s stables. Three men want Wolfe to find the killer, each of them dislikes the others but they all need the crime to be solved. The third story, “Disguise For Murder” was my favorite of the three, both for the characters and the situation; the murder takes place in Wolfe’s brownstone, in his office, while there are over a hundred visitors. The occasion is a visit from members of a Garden Club, there to see the orchids, of course, but things go badly awry. All that is extremely unusual, and this is the only Wolfe story I can recall where the crime is committed at Wolfe’s home. [see Art Scott’s comment, below] A really good one. It was a pleasure to drop by the brownstone and spend time with Archie Goodwin and Nero Wolfe. It had been far too long. There are still a very small number of Wolfe books I’ve not read (this had been one of them) but I need to remedy that. For those who decide to try one a Nero Wolfe story for the first time, I’d suggest Fer-de-Lance or Too Many Cooks. I agree on TOO MANY COOKS. I haven’t read this one. I remember enjoying the stories in CURTAINS FOR THREE when I read them a few yeas ago. Nice choice! Rick, you remind me that I need to get to work on a piece I’ve long contemplated writing, entitled “The Most Dangerous Address in Manhattan”. The death at Wolfe’s home in “Disguise for Murder”, is anything but unusual. If you survey the entire canon, you’ll discover that the number of corpses hauled away from that West 35th St brownstone is truly staggering. Art, thanks for the correction, I need to read that article, as soon as you write it! I guess it’s a matter of old guy memory. I haven’t read any of these in a couple of years (maybe more) and just didn’t remember murder in Wolfe’s office, or the house, in others. The more I reread the Nero Wolfe mysteries, the more I enjoy the novella length stories. I remember the title “The Gun with Wings” but not much about the story; and I have forgotten entirely “Bullet for One”. So I should reread this one sometime soon. The one with death at the Garden Club party I remember well, and have always liked. A very clever story. I think these are a little like potato chips, once you read one, you want to keep on. I had been reading a fantasy trilogy, and took a break from it with this Wolfe. It took me about 10 pages to readjust, then I couldn’t stop reading, it was so nice to get back in the brownstone. Damned things are addictive, aren’t they. Wish I had more time. Yes they are, and that’s a good thing. Fortunately, the novellas don’t take a lot of time to read. I enjoyed these three novellas, Richard. They are three that I reread every now and then. My favorite is the garden club one though I think Archie is a bit slow-witted in perceiving the threat to the victim. I wish there had been twice as many Wolfe books and that I was still discovering them. As you know, the reason Archie didn’t try harder is that the woman said she would only tell Wolfe, and then Wolfe demanded Archie get back upstairs. Still, I agree Archie should have at lease had Fritz or someone keep an eye on the office door. I’m lucky enough to still have some I haven’t read, as I’ve been “saving” them for later. I’ll be making a dent in those soon! 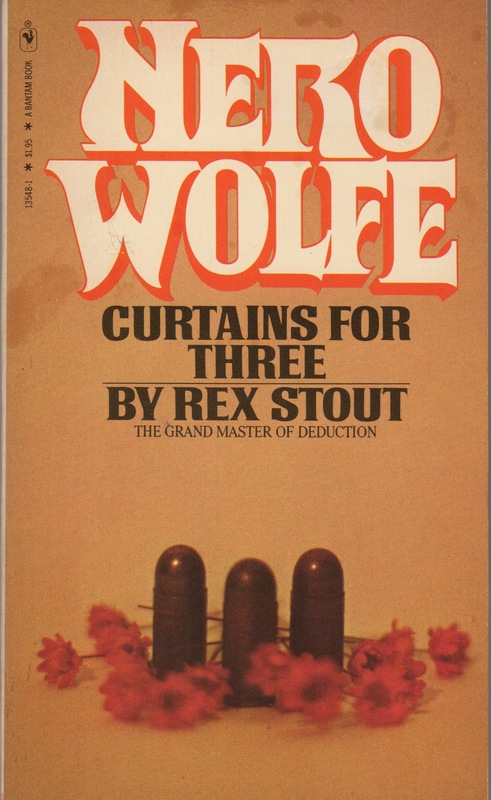 When I read a Nero Wolfe collection I think the novella is a perfect length for Wolfe and when I read a Nero Wolfe novel I think that’s the perfect length for Wolfe. I’m inconsistent but I am consistent in this inconsistency. Heh! Just right, Jerry, just right. I often wish the novellas were just a bit longer.